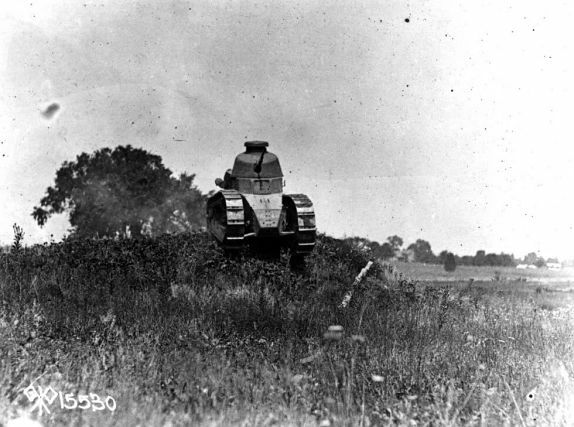 A light Renault tank drives across the Bliss Farm. 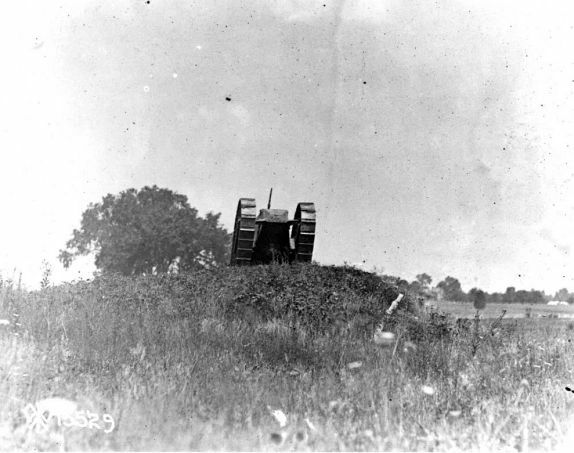 This view was taken facing east circa the summer of 1918 and is courtesy of the Eisenhower National Historic Site. Camp Colt was established in 1917, and opened at Gettysburg National Military Park in March, 1918, as the first post to train soldiers to use tanks during World War I. Captain Dwight D. Eisenhower was placed in charge of the fledgling Tank Corps. Today we’ll take a look at one of the first tanks delivered to Camp Colt. This wayside sits along the Emmitsburg Road (which can be seen in the foreground of the image on the waymarker). As always, you may click on this image to enlarge it and read more about the history of the camp. This view was taken facing southwest. Fresh off of his experiences at West Point, Captain Eisenhower applied numerous times to the War Department in the fall of 1917 and the spring of 1918 for overseas duty. In the winter of 1917-1918 he was assigned to Camp Meade, Marlyand, where he helped to ready the 301st Tank Battalion. 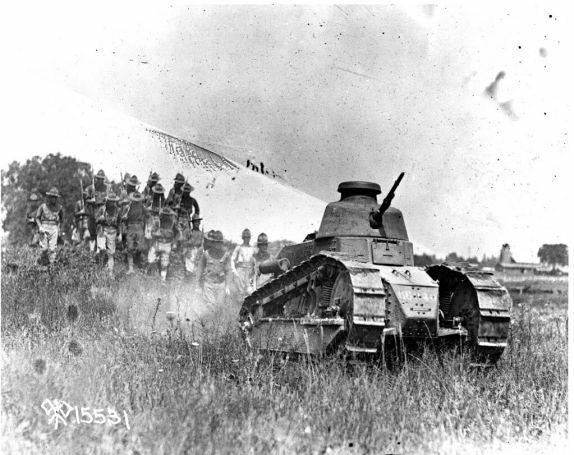 Promised a command, the 301st Tank Battalion was deployed to France in March of 1918, but without Captain Eisenhower. 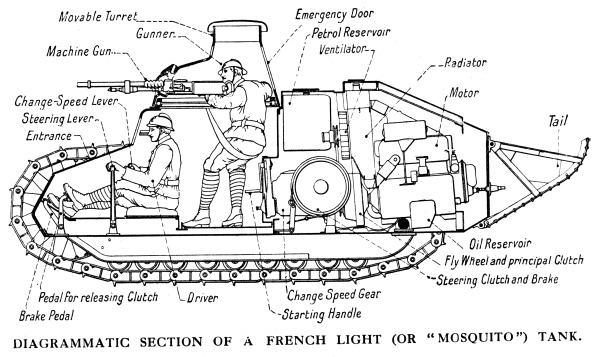 A view of the light Renault tank delivered to Camp Colt. In the left background you can barely make out Camp Colt troopers following behind the tank. This view was taken facing northeast circa the summer of 1918. Cemetery Ridge is in the background. This image is courtesy of the Eisenhower National Historic Site. 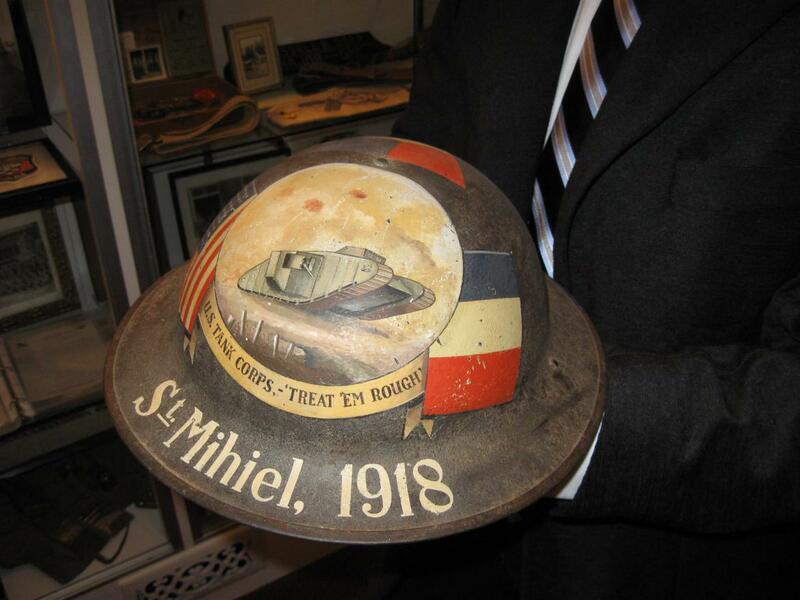 A painted tank helmet from World War I, from our series on the Gettysburg Museum of History. Notice the “Treat ‘Em Rough” motto that is also visible in the wayside earlier in this post. 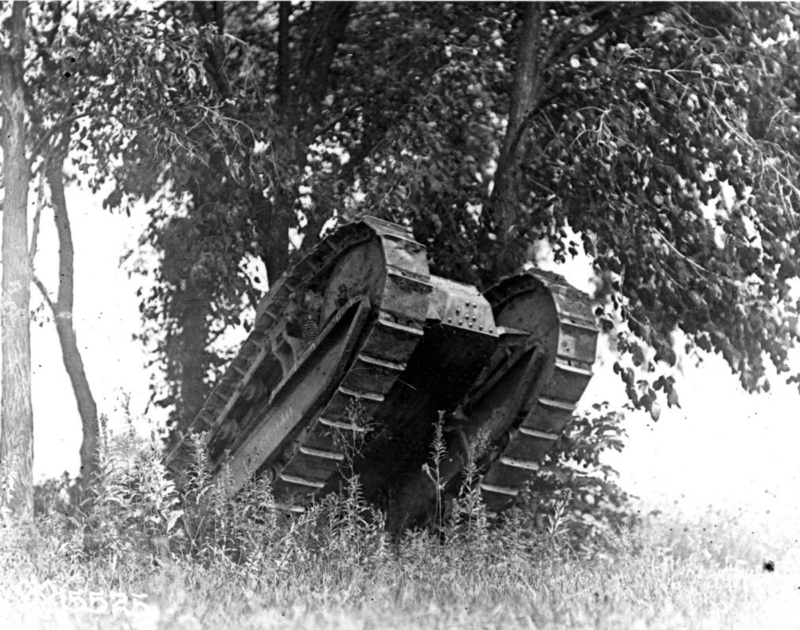 Eisenhower’s 301st Battalion, part of the Tank Corps of the American Expeditionary Force, saw its first major action at the Battle of St. Mihiel on September 12, 1918. This view was taken facing southwest at approximately 5:45 PM on Monday, February 1, 2010.. 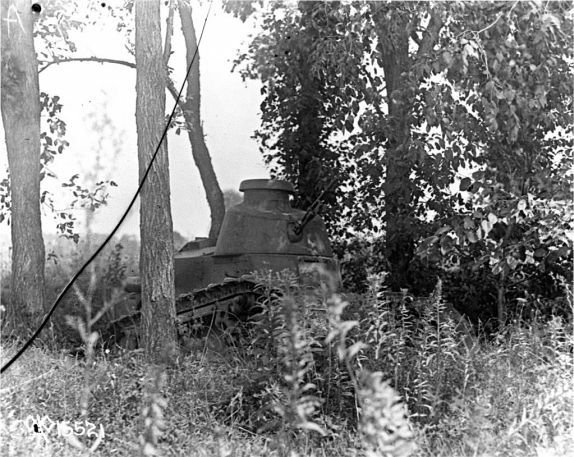 The light French Renault FT-17 tanks, like the one seen here cresting at the Bliss Farm, did not fare well at the Battle of St. Mihiel or during the Meuse-Argonne Offensive later in September. The small tanks were prone to running out of fuel and getting stuck in the mud. This view was taken facing east circa the summer of 1918. This image is courtesy of the Eisenhower National Historic Site. 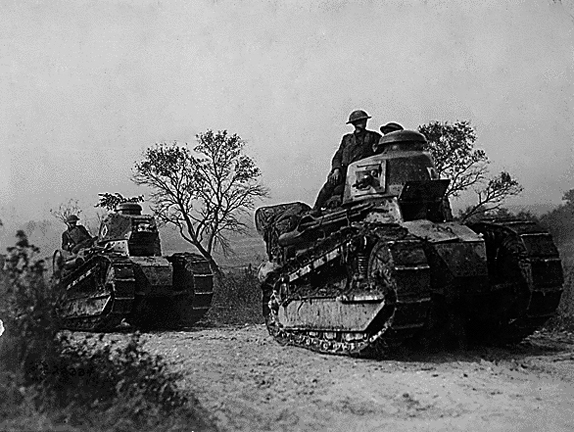 FT-17 Renault French Light tanks being operated in the Forest of Argonne by United States troops on September 26, 1918. 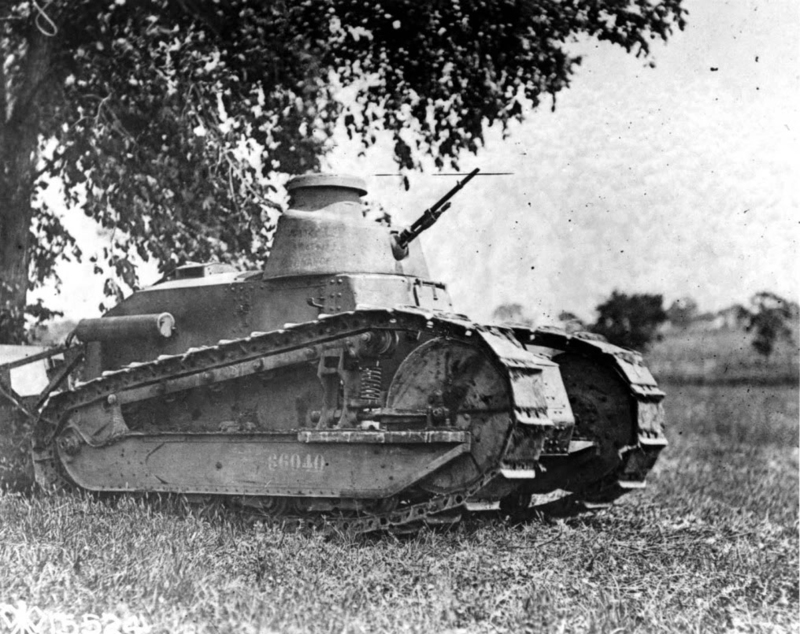 Though there were a number of variations of the kinds of FT-17 tanks produced, one of the most common was the Char Mitrailleur, which came equipped with an 8 mm Hotchkiss M1914 machine gun. This view was produced circa 1918. Eisenhower was not deployed with the 301st Battalion in March of 1918. Instead, he was sent with Mamie to Gettysburg, Pennsylvania, to command Camp Colt, the first tank training camp for the new Tank Corps. Eisenhower wrote: “Our numbers at Colt began to grow rapidly. I could forsee that before summer several thousand men might be in camp. Once they were competent in basic drill, they would have little to do […] Our chief source of information in 1918 came from newspapers and we had to use our imaginations.” The Camp was not well-equipped and in many ways, Eisenhower had to improvise. He created a telegraphers’ school and a driving school, “bolting machine guns to flatbed trucks” while his troops fired on targets positioned in front of Big Round Top. Much to his consternation, the Army had not given him tanks or tank guns to train with. By July, the camp had approximately 11,000 troops and personnel. 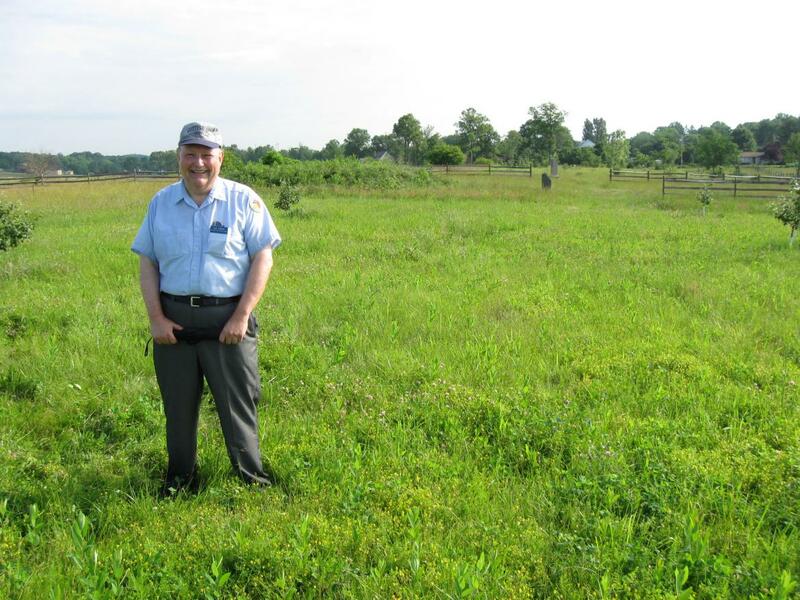 Troopers deemed fit for service were dispatched immediately from the train in Gettysburg to port and overseas. The orchard of the Bliss Farm is in the right background. 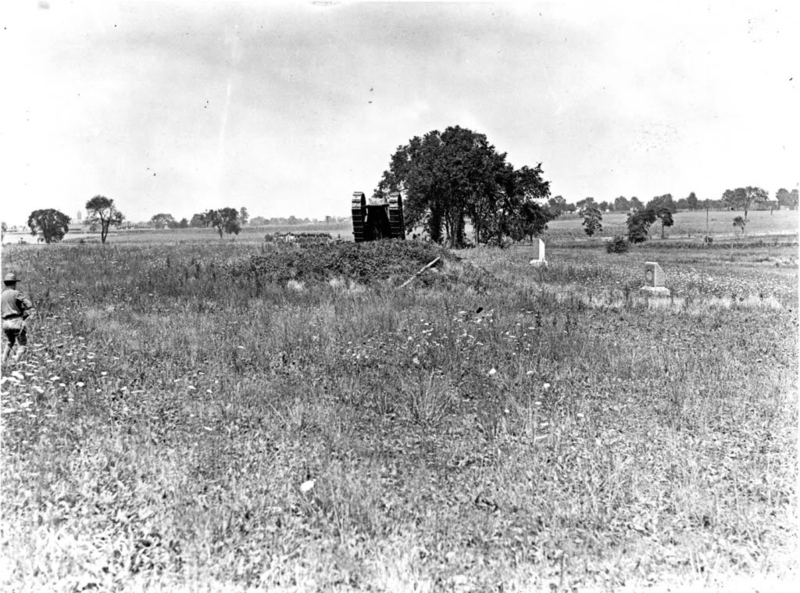 This view was taken facing southeast circa the summer of 1918. This image is courtesy of the Eisenhower National Historic Site. As we posted previously, the painting is not to scale. The Bliss House is in the right background. The Bliss Barn (bank barn), of whose bank the tank has been driven over in the previous photo is in the left background. The small white house in the foreground is the Brian Tenant House along the Emmitsburg Road. 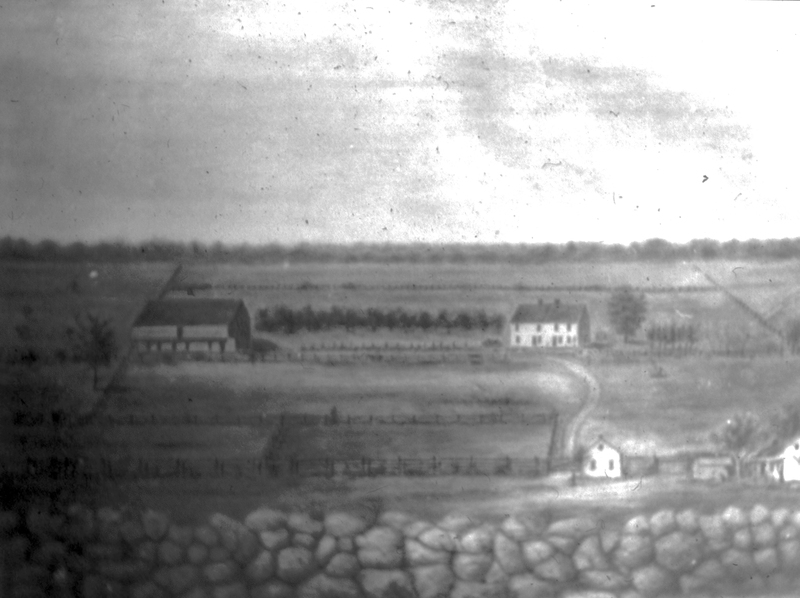 The Emmitsburg Road is not clearly shown in this painting. The lane that leads to the Bliss Farm from the Emmitsburg Road. The stone wall in the foreground is on Cemetery Ridge. This view was painted facing west at an unknown time. At this time in military history, soldiers had to learn how to move effectively with tanks. They were taught to move with and in close-order formation behind the tanks. 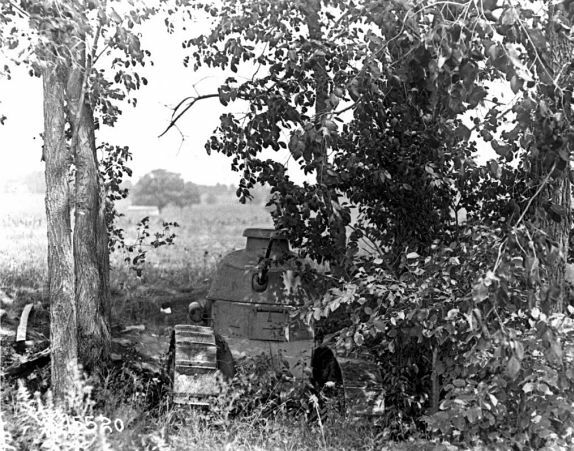 The soldiers we briefly saw in previous photo are now in the right-rear center of this photo to the left of the tank as it comes over the bank of the Bliss Barn. The monument to the 12th New Jersey Infantry is the white monument to the right of the tank, and closer to the right foreground is the monument to the 14th Connecticut Infantry. This view was taken facing east circa the summer of 1918. This is the almost the identical angle of the previous photograph, shown in The Struggle for the Bliss Farm, with LBG Woody Christ. The photographer in the 1918 photo would have been positioned farther to the left. The monuments to the 12th NJ and 14th CT are in the right background. This view was taken facing east at approximately 8:00 AM on Saturday, June 13, 2009. Here is the tank as it crests the bank of the Bliss Barn. The Renault FT-17 had a 39 HP gas engine and attained a speed of 4.35 MPH. Approximately 2,600 FT-17s were produced in 1918. This view was taken facing northeast circa the summer of 1918. 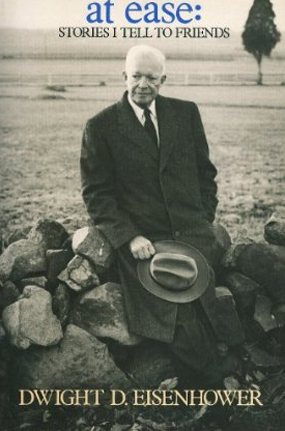 Eisenhower would earn the Distinguished Service Medal for his efforts at Camp Colt. The barrack buildings of Camp Colt can be seen in the right background. This view was taken facing east circa the summer of 1918. 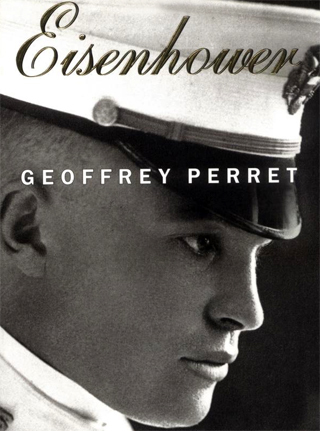 … and from Geoffrey Perret’s biography, entitled Eisenhower.